We have a history of foot problems in our family so I am super picky about what shoes I put on Elizabeth’s growing feet.Â I try to stick to shoes that have been certified by the AmericanÂ Podiatric Medical Association to be good for developing feet.Â (Here’s a list. )Â Unfortunately, that means all the shoes are really expensive.Â I still haven’t bought a pair at full price.Â So far I’ve found all ours used or on a good sale. I like these shoes.Â I don’t love them.Â They aren’t as flexible as some of our others.Â They are sturdy and seem well made.Â We just got them, so I can’t say for sure how they will hold up, but they seem like they will wear well.Â We bought these new, on sale. 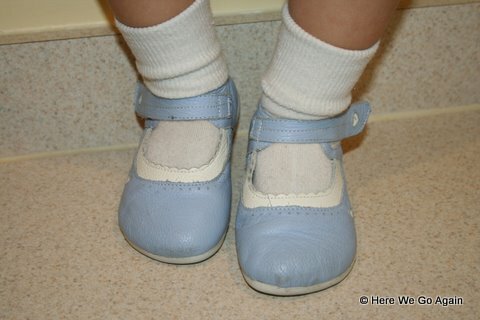 Next up, we have these blue Pedoodles.Â These are extremely flexible, comparable to those leather baby shoes, but with slightly thicker soles.Â I kind of consider them more of an indoor shoe.Â I mean, obviously she does wear them outside, but if we are going on a walk in the woods or to the playground, I put something more sturdy on her.Â If it were me, I wouldn’t want to wear these on sharp rocks or anything like that.Â We bought these new, on sale.Â They are not wearing as well as I’d like.Â They looked used almost immediately after she put them on.Â You can see some scuffing in the picture and I had just cleaned them because she is going to wear them in our family portraits.Â (Which we still have not gotten taken- I KNOW. )Â They are seriously adorable though. These black, patent leather shoes are Stride Rite, Toddler Tech.Â Not all Stride Rite shoes are the good for the feet ones, so we are careful only to buy the flexible ones.Â These are nice and flexible and also really well made.Â These are pretty much the only shoes I’ve been able to find used.Â (This is Elizabeth’s fourth or fifth pair of similar shoes that I’ve found used- and for as low as $1.50. )Â They wear very well and look nice.Â Since I bought this pair used, they are on at least their second child.Â Elizabeth is about two days away from outgrowing this pair and they are still in beautiful shape. 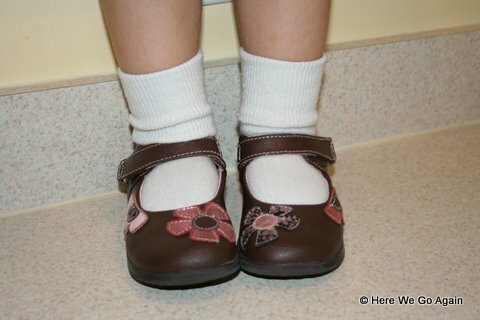 Lastly, my favorite brand of shoes.Â These are Pedipeds.Â Elizabeth has been wearing this pair since November.Â Yes, November.Â They still look brand new.Â They are incredibly flexible (you can actually fold them in half) but still really sturdy.Â (I don’t know how they do that. )Â Pedipeds also come with an extra insert to size them down a size, so you can get more wear out of them.Â This is how she’s been able to wear them so long.Â (Actually, I haven’t even taken the insert out yet, she’s probably got a while left to wear this pair.Â Although, to be fair, she started wearing them when they were too big, she just loved them so much she would cry when we’d say no. )Â I have another pair of these in a larger size that I found on a good sale and bought ahead and I cannot wait until they start to fit because they are even cuter than this pair.Â I would wear Pedipeds if they came in my size.Â We bought this pair new, on a Black Friday sale right after Thanksgiving. 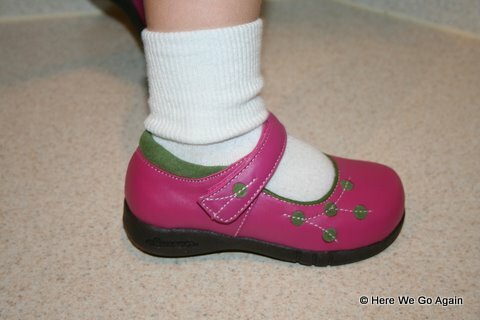 Do you have any favorite shoes for kids?Â Or do you have any of these shoes that you want to sell to me?